This laboratory work-guide is designed for use with the textbooks Electronic Devices by Thomas L. Floyd. The 43 experiments cover virtually every basic aspect of circuits containing rectifier and zener diodes; bipolar, field effect (JFET, MOSFET), and unijunction transistors; silicon-controlled rectifiers; operational amplifiers; and integrated-circuit voltage regulators, timers, and phase-locked loops. The experiments are general enough to be easily integrated with any textbook on semiconductor devices at the electrical/electronics technology level. The experiments in this guide reinforce and expand upon the concepts presented in the classroom. The student is able to verify these concepts by performing detailed step-by-step experiments that are easily accomplished in a typical two- to three-hour lab session. In all cases, experimental measurements can be reasonably compared to theory. Although there are 43 experiments, the student will be expected to perform only a select number of them. It is not necessary to treat all the experiments separately; some may be conveniently combined as a single major experiment. Experiments 9 through 12, for example, concentrate on the biasing of bipolar transistors and can easily be consolidated. 1. The purpose of each experiment is clearly defined. 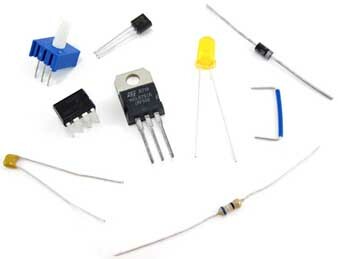 In addition, a short background summary on the operation of the circuit to be investigated is included. 2. At selected portions in a number of experiments, photographs of the oscilloscope’s display give students a picture of what they should observe on the screen. 3. For each experiment, a list of required parts and test equipment is included. All parts are low in cost and are readily obtainable from a number of sources, including Radio Shack. 4. When appropriate, a summary of useful formulas is included to enable the student to compare measured results to theory. 5. A summary of “What You Have Done,” presented at the end of each experiment, restates and re-emphasizes the main points of the experiment as stated in the “Purpose and Background” section of the experiment. 6. There are “student response” sections at the end of each experiment. These sections are for the student to enter the objectives/purpose, the schematic diagram(s), all measured data (on a blank graph page when required), and the results and conclusions of the experiment. 7. Multiple-choice review questions are included.